Have a question on Grand Vitara? Grand Vitara is available in 2 different colors - Bison Brown Pearl Metallic and Superior White. Watch latest video reviews of Suzuki Grand Vitara to know about its interiors, exteriors, performance, mileage and more. Well-known automobile manufacturer, Suzuki Motors is exceptionally popular for its products in all the classes of UAE auto market. The third model in the series of SUV is named as Grand Vitara, and the basic concept remains the same since its inception in the year 1988. “Bringing higher performance to the urban cross-country vehicle” is the concept that Grand Vitara’s engineer follows. Although, the development team producing the vehicle employs 4-mode 4X4 drive that would take the brands reputation to the next level. For UAE buyers, the Grand Vitara is made available in two body styles, the 3-door and 5-door. The 5-door variant is further distinguished in JLX and DLX trims. When it comes to power and performance, the manufacturer has not disappointed its customers by providing an exceptional fuel efficient petrol engine for all of its variants i.e. a 2.4-litre VVT 4-cylinder engine. This powerful engine delivers the maximum power of about 167 hp, along with the peak torque of about 227 Nm at 3800 rpm. Basic idea behind its mechanism is to improve its all-road mastery including excellent performance, practical urbanity, and easy access of every aspect embedded in the car. Complementing its incredible performance, the Suzuki Grand Vitara is a great combination of bold styling with conventional design that stands out from the crowd. Exhibiting its sporty appeal, the short front overhangs and large-diameter tyres, along with flared fenders contributes to the appearance which offers assured stability. In addition, its is embedded with built-in turn signal lamps integrated on the body colored exterior mirrors, front fog lamps, spare wheel with body colored cover and body colored door handles enhancing the side facade of this sporty vehicle. Although, its sporty and muscular design continues inside, which shows well-designed aspects complementing the elegant internal outline and offering a true sense of sophistication. Its classy cabin is provided with comfortable seats covered with quality leather, black wooden grain at the centre console, tilt adjustable steering wheel mounted with audio and cruise controls, CD tuner with MP3 compatibility and automatic air conditioning system. In addition, its advanced combination of active and passive safety features offers maximum peace of mind to the occupants. Standard safety elements includes Anti-lock Braking System (ABS) with Electronic Brakeforce Distribution (EBD), Brake Assist system and dual SRS airbags embedded in the seats of driver and front passenger. The cabin of Grand Vitara is well-furnished with number of facets, making the vehicle an ingenious place to rely, during your long journeys. The seats are covered with quality leather providing exceptional comfort to the passengers. The black wooden grain at the centre console garnishes the cockpit, although leather door trims makes the interior looks more classy and elegant. Its contoured surfaces and rounded edges brings a true sense of sportiness. Further, the ac vents are also placed at the dashboard that regulates the cabin’s temperature even in the hot climate conditions. Its leather covered steering wheel is mounted with various controls, resulting an uninterrupted drive for the driver. To entertain the occupants, this SUV is embedded with CD tuner with MP3 compatibility featuring AUX-in interface for your convenience. Key less entry makes you enter the car easily. The classy and daring design of New Grand Vitara exhibits its perfect blend of classic forms and renowned interior. This amazing car by Suzuki is bestowed with responsive steering wheel mounted with audio and cruise controls increases the comfort element for the driver. Seats are covered with quality leather which not only creates an elegant ambiance, but also offer exceptional pleasure to the occupants. Automatic car conditioning system, along with embedded audio unit allow you to enjoy your long journeys. In addition, it has 4 quality speakers that distributes soothing music inside the cabin. Appointed power sockets let you charge your phone and laptop. New Grand Vitara is quite spacious and can accommodate five individuals comfortably at a time. It comprises an impressive boot space which has the volume of 395 litres. This volume can be extended further with its foldable rear seat functionality. When it comes to entertainment, new Grand Vitara is integrated with basic audio system that allows you to browse through your favorite music, during the long journeys. The audio unit features a CD tuner along with MP3 compatibility that plays all the tracks. In addition, the digital audio display is also appointed that let you easily access the music system. Audio controls are mounted on the steering wheel enabling the driver to change the music easily. Moreover, you can browse through your playlists with the Aux-in feature. Also, the incorporated speaker creates an interesting ambiance inside the cabin with its sound quality. The looks of new Suzuki Grand Vitara shows its athletic touch with its muscular and well-proportioned design integrated with some quality elements. Projecting sporty appeal, its short front overhangs and large-diameter tyres, accompanied with flared fenders contributes in a look which offers assured stability. The built-in turn signal lamps mounted on the body colored exterior mirrors further enhance its side profile. Front fog lamps appointed at the front end offers better visibility even in foggy climate conditions. All of the doors are integrated with green-tinted windows proposes a better view of the outside world. The incorporated roof rails at the top gives new measurements to the drive, while accentuating its sporty factor. Also, to boast its side grace, the clean and tidy doors are appointed with body colored handles making entire appearance unique and classy. In addition, a spare wheel is also offered along with a body color cover, which embraces Suzuki insignia at the centre. Further, the tailgate is incorporated with rear defogger, making your car visible to other drivers. The exterior dimensions of Grand Vitara are well-designed to give dynamic appeal to the SUV. The 5-seater has specific measurements as 4500-4060mm x 1810mm x 1695mm (L x W x H) that ensures enough headroom and space for all passengers. The large wheelbase is about 2640 mm. All-new variants of Grand Vitara comes fitted with a range of alloy wheels starting from 16 inch embracing the tire size of 225/70R16 to 18 inch with the tire size as 225/60R18. These stylishly designed rims adds enough grace to the style quotient of this vehicle. All-new trim levels of new Suzuki Grand Vitara has been integrated with highly responsive powertrain which is packed with VVT (Variable Valve Timing) which improves the vehicle’s performance, fuel consumption and emissions. This SUV powered with 2.4 litre petrol delivers the fair mileage of about 10.5 kmpl in combined driving situations. All-new trim levels of Grand Vitara comes integrated with 2.4 litre VVT 4-cylinder petrol engine. This powerful engine has the capacity of generating 167 hp of maximum power at 6000 rpm, along with the peak torque of about 227 Nm in 3800 rpm. The SUV is available with 4-mode 4X4 system that transmits the generated power to all wheels individually at all times, making sure of a positive traction regardless of road edge. Further, the equipped efficient engine is paired with 4-speed automatic transmission, helps the vehicle in improving the output, while delivering a decent handling to the driver. Suzuki has incorporated this sporty SUV with a power packed petrol engine which comprises 4 in-line cylinders, fitted with 16 valves. To improves its overall performance and fuel economy, this efficient engine is appointed with VVT (Variable Valve Timing). This 2.4 litre engine churns the maximum power output of 167 hp, along with the high torque of about 227 Nm in 3800 rpm. Equipped 2.4 litre VVT petrol engine is coupled with 4-speed automatic transmission provides better handling and flexibility to the acceleration and pick up. This SUV can attain the top speed of about 175 kmph, and breach the 100 kmph mark within 11.5 seconds. Braking and suspension is one of the most crucial facet of a vehicle, which increments its performance. An efficient suspension mechanism is employed in this SUV, consisting MacPherson strut with coil springs at the front axle and multi-link suspension for the rear. When its comes to its dynamic braking system, the front and rear pair of wheels are employed with a set of ventilated disc brakes offering better handling of the vehicle. Further, the advanced system which enhances its braking system includes anti-lock braking system (ABS), along with electronic brakeforce distribution (EBD) and brake assist function which allows driver to better control the vehicle. The proficient braking mechanism comprising anti-lock braking system (ABS) along with electronic brakeforce distribution (EBD) applies the right amount of braking force at the time of sudden braking. Additionally, it is employed with traction control and electronic stability program induces rotation by applying braking force on the appropriate wheel at the event of over-steer and under-steer. The brake assist system employed in this car, increases the braking pressure at the event of emergency. In case of any accident, this car is embedded with SRS dual airbags for the driver and front seat passenger. Its pedal is developed to reduce protrusion, whereas the energy-absorbing trim is set as standard in all variants. Other standard and optional safety aspects includes, 3-point ELR (Emergency locking re-tractor) seat belts, along with pre-tensioners and force limiters, ISOFIX child attachments and high-mount stop lamp. What is the price of Suzuki Grand Vitara? 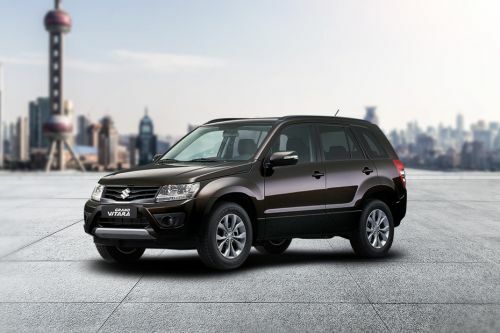 On road prices of Suzuki Grand Vitara in starts from AED78,900 for base variant 3 DOOR, while the top spec variant 5 DOOR TOP costs at AED97,900 . What are the colors options available in Suzuki Grand Vitara?